p.s. The entire “The Best of Country Sing the Best of Disney” album is worth a listen. I recently worked on a three-part series on grief for Metro Parent magazine. It looked at grief and loss from three perspectives: parents grieving the loss of a child; children grieving the loss of a parent; and parents grieving the loss of their spouse. It was a humbling experience. For part one of the series, I came into contact with Michelle Murray. She is the mom behind “I Will Hold You in My Heart Forever…A Baby Book for Little Angels.” I drafted a sidebar on this book that didn’t make it into the final story that ran in the magazine. I’d hate for the world not to know about this special book, so I include below the short article I wrote on Michelle and her creation. Please share the info below with anyone you think might be in need of this special book. Thank you Michelle! Michelle Murray of Toronto gave birth in 2006 to her first child, a boy she named Tyler. She knew from early in her pregnancy that Tyler would be fighting an uphill battle because of a severe heart defect detected during her 18-week ultrasound. Still she held out hope that her little guy would survive the three major surgeries he would undergo during the first five years of his life. Sadly, that was not to be. Tyler died at home in his mother’s arms at seven weeks old. Devastated, Michelle and her husband Jason went on to have two beautiful and healthy little girls. While filling out her second daughter’s baby book while home on maternity leave, Murray realized that she had no baby book for her firstborn. “He was here. He lived,” Murray reflects. And so she embarked on a mission to find a baby book appropriate for accurately telling Tyler’s story. Murray had little success finding something for chronicling her son’s short life and the grief journey that followed. In her search for something appropriate, Murray came across some somber memory books but nothing that captured the happy moments of her pregnancy and the almost two months she had with her son before he died. She decided to take matters into her own hands working with her sister-in-law, a graphic designer, to create a baby book that works for any parent who has lost a child at any age. 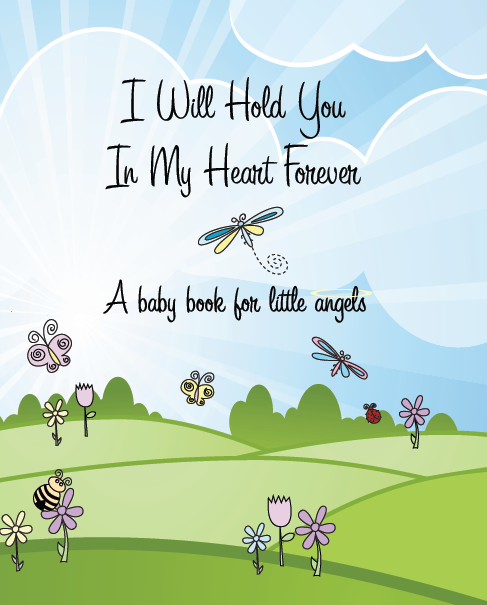 Titled, I Will Hold You in My Heart Forever…A Baby Book for Little Angels, the book Murray created includes space for the happy moments every expectant and new parent experiences but also includes space for parents to share their experiences after their child’s death. “I wanted my two daughters who never met Tyler to see his life story. This was a way for them to get to know their brother,” Murray says. The book is laid out in binder format so the pages that aren’t relevant can easily be removed. Murray has also found that some parents who have lost older children are transposing the contents of the child’s original baby book into this one. Murray has received letters from many of parents who’ve found the book to be a source of comfort. Retailing for $39.95, I Will Hold You in My Heart Forever…A Baby Book for Little Angels, can be purchased online at www.foreverheart.ca.